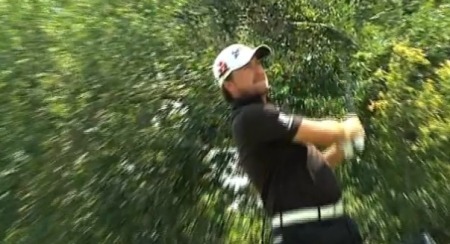 "I played very nicely, kept the ball in play and hit a lot of fairways," said McDowell. "I like the way this golf course is set up. I holed a few nice putts coming in there and it is just the start I was looking for." Starting on the back nine, McDowell bogeyed the 10th but caught fire around the turn when he birdied the 18th and then picked up four more shots at the first, second, fifth and sixth before a bunkered drive cost him a stroke at the seventh. He explained: "I hit three wood through the fairway into the trap on 18 and I was aiming at the middle of the green and managed to hit a nice pull in there to six feet to make birdie. "That kind of sparked me off. I hit it close on one and made a nice putt on two and it got me off and running. Birdieing five and six was sweet. I hit it under the lip of the bunker on seven and made bogey there but apart from that it was a good last 11 or 12 holes for me. Amazed to hear that he only hit five fairways, he said: "I felt like I drove it better than that. Five fairways - is that all? I did feel like I drove the ball well. It is a funny golf course. There are a lot of crosswinds and it was breezy enough at times. It is a fun litle golf course." McDowell hit 13 of 18 greens and took just 27 putts. He was also one of the top putters per green in regulation. But it was not a day to remember for Harrington, who is hoping to find his scoring hat before next week's US Open at Bethpage Black. The Dubliner hit one more fairway than McDowell - six - but found just seven greens in regulation as he carded four bogyes against two birdies. Considering he missed so many greens, it was no great surprise that he needed just 25 putts. On the positive side he will have been pleased to see that his scrambling was close to its best as he got up and down 66 percent of the time. Starting on the 10th, he holed a good six footer for a two-putt par before draining a 30 footer at the 157 yard 11th to dip into the red. But that was as good as it got for the world No 11. Bunkered in the fairway trap left of the 13th, he laid up shot of the green but missed from 10 feet for par to slip back to level. He then found water with his tee shot at the 239 yard 14th to slip to one over par before getting up and down from greenside sand for a birdie at the par-five 16th. Back to level, he handed back a shot in frustrating fashion at the 17th, where he was through the back of the green in two but ended up three-putting from four feet after a decent recovery, knocking his par putt three feet past the hole. He got up and down from 20 yards right of the 18th green after a pushed tee shot but got nothing going on the back nine with a bogey at the second followed by a run of pars. Phil Mickelson shot a 68 and was happy to take his mind off his wife Amy's battle with breast cancer as he chatted with playing partners Harrington and Cameron Beckman. "They are two of the nicest guys on tour and two intelligent guys. You can talk about a lot of stuff with them," Mickelson said. Harrington knows exactly what the left-hander is going through having lost his father Paddy to cancer in 2005. "I know when my dad had cancer, the easiest time was on the golf course because you don't have to answer any questions," Harrington said. "You don't have to explain yourself on the golf course. You've got to remember — we're quite proficient at dealing with that little white golf ball, not quite as good about explaining our emotions." 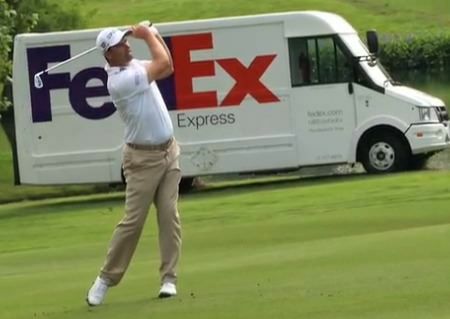 Pádraig Harrington — pictured doing his bit to raise awareness for the campaign against testicular cancer — bounced back from two early bogeys and some disconcerting putting to open with a solid two under 68 in the weather-interrupted FedEx St jude Classic in Memphis.